We have released a new model T85 shear beam load cell, manufactured from stainless steel and with OIML R60 approval to 3000 divisions (C3). This replaces the previous 350i load cell model. The T85 is available at capacities from 300kg to 10000kg (specifically 300, 500, 750, 1000, 1500, 2000, 2500, 3000, 5000, 7500 and 10000kg) with a 4-core screened Polyurethane cable. It is the ideal solution for problem-free, "fit-and-forget" weighing in harsh applications (such as humid, wash-down environments). OIML R60 approval to Class C3 (3000 divisions) is a standard feature. ATEX approval is available for all zones, with the protection mode 'ta' allowing use in dust zones 20, 21, 22 without safety barriers - which permits a large cost saving compared with other protection modes such as 'ia'. The standard version can be used at extremes of temperature, from -30 to +70 degrees C; therefore it is suitable for use in a wide variety of applications without the need for our special high temperature option. However, for applications requiring use at continuous temperatures of up to +150 degrees this optional version is available. As with many of our other load cells, this has a Five (5) Year Warranty against manufacturing defects as a stamp of the confidence we have in our high quality, modern manufacturing processes and individual load cell compensation. We physically test, optimise and compensate every single load cell individually before it is allowed to pass our stringent quality checks. Our standard industry-leading Polyurethane cable is of course included, which ensures much better cable protection than the industry standard PVC cable in in environments subject to stringent cleaning requirements using harsh chemicals. Protection to IP68/IP69K is assured due to the fully welded and hermetically sealed design that is suitable for wash-down cleaning processes using pressurised hot water - often seen in meat, poultry and fish processing facilities such as abattoirs and sluaghterhouses. 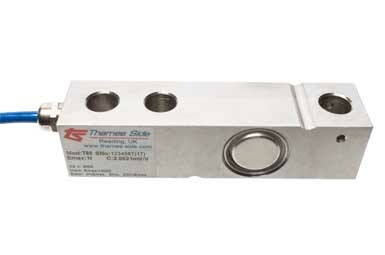 For extremely demanding applications, where strong chemicals (e.g salt environments) and stress corrosion are a concern, we can supply this load cell with a special Parylene coating that protects the load cell and significantly increases its working lifetime. Contact us for further details about this. For applications where stainless steel and full hermetic sealing are not required, the model T85-N (shown above) is available in nickel plated alloy steel. The T85-N has OIML C3 approval, IP66 ingress protection and a 4-core PVC sheathed cable. It replaces the previous 350n load cell model. If you would like further information about this benchmark high accuracy shear beam load cell, or its possible use in your application, Contact Us now.